During the first four to five months, until breakup between partisans and chetniks in Serbia, almost all chetnik and Serb nationalistic groups in Eastern, Central and North-West parts of Bosnia, which where in German zone of control participated in July uprising 1941 and cooperated with Partisans. After breakup, chetnik forces and population which supported them found themselves in the rift between Ustasha and German forces on the one side and Partisans on the other. 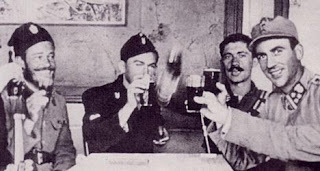 Efforts of Major Dangić in the early 1942 to find modus vivendi with Germans in Eastern Bosnia have failed, and local leaders had to find new solution to there problems. 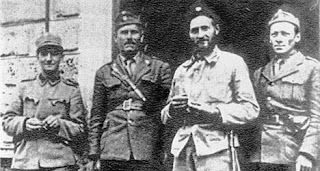 Chetnik groups which fundamentally didn't agree with NDH authorities at any point but in partisans they saw common enemy and that was the reason which removed all obstacles for collaboration which followed between NDH authorities and many chetnik detachments. From January 1942 all NDH forces inside zones of operations came under German command and from October 1942 entire Bosnian territory between Sava river and demarcation line become Operative Zone under German rule, those agreements represented indirect way of chetnik collaboration with Germans. First formal agreement between NDH and Bosnian Chetniks was signed on May 28th, 1942 in village Lipac, single document which covered Ozren and Trebava chetnik detachments, and covered part of Eastern Bosnia near river Bosna and railway Sarajevo-Brod. On July 9th, amendment in form of a statement was added by which agreement regulation also cover relations of two Chetnik detachments with German and Italian forces in NDH. It seems, but NDH government doesn't state them, that two similar agreement have been signed earlier first with Uroš Drenović, commander of Chetnik detachment "Petar Kočić" in Varcar Vakuf (Mrkonjić Grad) in county office on 27th April 1942, on NDH part agreement was signed by county Marko Jundić, Home Defense Major Ervin Rataj and acting ustasha logornik K. Urumović. As long as there is a danger of armed partisans gangs, chetnik formations will voluntary cooperate with Croatian armed forces in fighting's and destruction of partisans and in these operations will be under the command of Croatian armed forces. In these operation chetnik commander will command there detachment. Chetnik formations can involve themselves in operations against partisans at there own initiative, but they must report this to Croat military commanders in advance. Chetnik detachments will be supplied with need ammunition by NDH military authorities. Chetniks wounded in anti-partisan operations will receive care in NDH military hospitals, and widows and orphans of chetnik soldiers killed in combat against partisans will receive direct financial aid from the state equal to one being received by widows and orphans of NDH soldiers. If possible, NDH authorities will secure release and return to there homes persons taken to concentration camps, but only at special recommendation of chetnik commanders (to avoid any partisans or there supporters). Until these persons return, financial aid will be given to there families, if need. All refuges will be able to return to there homes and, if need, will receive state aid comparable to one being given to other citizens of NDH. Serbs will be allowed trade as any other citizen. As a sort of recapitulation of agreements with Bosnian chetniks, Poglavnik HQ (poglavnikov glavni stan) sent on July 30th 1942 to Ministry of Social care report with signature of Field-Marshall Kvaternik, in which sums up provisions of these agreements in twenty clauses which in general outlines respond to provisions stated above. Copies of the report where to be sent to committee for social care at municipality courts which decided about financial aid to families of those Home Defence soldiers which had rights to it and which also decided about paying those chetniks families which had rights to it by these agreements. Germans where for these agreements because of several reasons. First, agreements where directed against partisans which since summer of 1941 become main German problem in Yugoslavia, even in areas of Bosnia under German control; second addition of chetniks into fight against partisans reduced number of German soldiers tied to these areas; and finally these agreements helped to pacific Bosnian, North-East and North-West areas, in which Germany had important economical interests - iron ore, wood, heavy chemicals, steel and important railway lines - report of General Lüters, commander of German Army in NDH, from November 18th 1942, points out both military and economical effects of agreements between NDH authorities and chetniks. On July 15th 1942 General Glaise even suggested to General Ivan Brozović in Banja Luka to form central office in Zagreb for implementation and supervision of the agreements. Nothing become of that suggestion because at that moment such office would represent difficulties for Ustashi regime, but as it will show later one central office was put in charge for those agreements. There is no doubt that agreement included majority of chetnik forces in Bosnia east of demarcation line, because Glaise report from November 16th 1942 to Wermacht commander for South-East Europe shows that around 10,000 bosnian chetniks has agreement with NDH authorities on the principle 'live and let others live'. Map which was made by General Staff of Croatian Home Defence, dated on January 17th 1943, divides chetniks on NDH territory into three groups: Italian chetniks, concentrated around Otočac in Lika, area of Knin in Northern Dalmatia and in Eastern Herzegovina; collaborationist chetniks in Central Bosnia and in parts of East Bosnia around river Bosna; and rebel chetniks holding minor parts in North-East Bosnia and area East of Sarajevo (map can be found at Military History Institute in Belgrade). Your facts are wrong. NDH was never under German control in was under Croatian control. NDH never collaborated with Chetniks because Chetniks were against NDH. Serb Chetniks and Partizans worked to destroy NDH. NDH stood for Croatian Freedom. Za Dom Spremmi. Hey anon., stop the Croatian historical revisionism. If you openly supported Fascism and holocaust denial in many European countdowns, you would end up in jail. BTW, NDH = Independent State of Croatia (in Serbian). I find this post incredibly disgusting! The Cetniks never collaborated with the Germans. They tried working with the Partizans, who had their own agenda and went on to create a bloody civil war and to murder thousands of Serbs who had been fighting the Germans--just not under the Partizan Communist command. This is especially true in Ozren. The people who defended it against the Nazis and Ustasi were later murdered by the communist Partizans. These communists took over and then falsified and invented history. BUT, we--the children/grandchildren of murdered Cetniks in Ozren--know who our families' killers and betrayers were. First: the Nazi Get-along-Gang of Germans, Croats, and Muslims. Next: the Serbs fighting with the Partizans and local nobodies who saw an opportunity to gain power in the aftermath by getting rid of neighbours who were more respected, well-off, and/or powerful in the pre-war society who had taken up arms to defend the villages against the initial Nazi onslaughts.